The Printer's Marketing System - Email Marketing. The powerful email marketing application stocked with ready to send content. Email Marketing For Printers – now you can nurture your leads and stay in touch with customers for a fraction of the cost and effort of other channels. 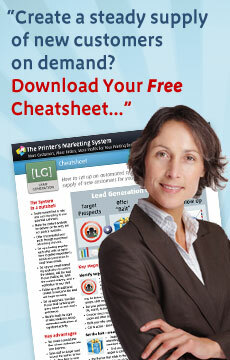 Our email marketing for printers program gives you powerful and flexible options. You can use our ready-to-send content in your existing workflow, or use our full featured email marketing application. If you already use Constant Contact or iContact, or a similar third party email service provider, our done-for-you email messages can save you a lot of time, effort and money. You no longer have to spend hours coming up with ideas, wrestling with html that never comes out looking the way you want, or spend a fortune on freelancers to do it for you. On the other hand, if you are looking for a powerful web-based platform to streamline and automate your email marketing campaigns, you can take advantage of the superior features of our own application. Either way, you save countless hours of creative and production time, and your campaigns are ready to blast with a minimum of effort and cost. Download your choice from our expanding library of messages in the member's area. Enter your settings once and all your messages are customized automatically. Or download a complete archive with HTML files and fully editable graphics files. HTML is optimized for correct display in major email clients. Source code is commented to allow straightforward editing of page modules by HTML savvy staff. To see the ready-to-use email content available in the member's area, sign up for a free demo account here. Make your choice from the extensive library of messages built into our email marketing application. Just a few clicks to customize and personalize your messages with our variable data system. Import your list and manage your contacts with built in CRM features. Automate your marketing with autoresponders, dynamic list segments, and triggered messages. See who opened which message and clicked which link, track your campaigns to the last detail. Please call or to request a private demonstration of our email marketing application: 888-896-7216.